Macao (1952) was the last film Josef von Sternberg made in Hollywood and he didn’t get to finish it. A tyrant on the set, particularly with his actresses, he treated Jane Russell so abominably that Howard Hughes removed him from the picture and brought in Nicholas Ray to reshoot the ending. I can’t condone a director who calls his lead actress a “beautiful stupid broad” and makes every effort to humiliate her on the set. I guess this was the pattern, from Marlene Dietrich onwards, and it seems to have worked with Dietrich. The two tormented one another over the course of seven films—the best either would make: Blue Angel, Morocco, Blonde Venus and Shanghai Express among them. But getting back to Macao, there’s an awful lot to like here even if Ray messed with von Sternberg’s vision. Robert Mitchum slouches to excellent effect, winning Jane Russell’s heart, and charming the tough-as-nails croupier played by Gloria Grahame while he’s at it. The dialogue is edgy from the start. Even bit players get their moment: the opening scene of the would-be Lothario doing a little rumba all by himself in his cabin, all to no avail, is a delightful vignette. The shadows are perfectly calibrated, during the chase scenes especially, when fishing nets lend a claustrophobic touch to the action. Russell sings, and she’s pretty good as a torch singer — far better than in her musical number with the gymnasts in Gentlemen Prefer Blondes. This noir may not be noir enough to satisfy purists, but I enjoyed it. Thanks for speaking up against the mistreatment of women performers by men directors. It goes on to this day. Your mention of the shadows led me to check the cinematographer on IMDB. It was Harry C. Wild (not a name I recognize), who also shot Murder, My Sweet, Stage Door Canteen, and Gentlemen Prefer Blondes. Probably another of those craftsmen trained by the studio system to do a little bit of everything. Finally, a suggestion (pardon me if I seem pushy this morning): give the film’s year of release after the title. Nicholas Ray’s involvement gave me the idea this was probably a 50s film, but I had to check IMDB to find out it was released in 1952. Thanks for the rec, John. I should probably do a column on neo-noir, looking at the cultural forces driving it, then and now. 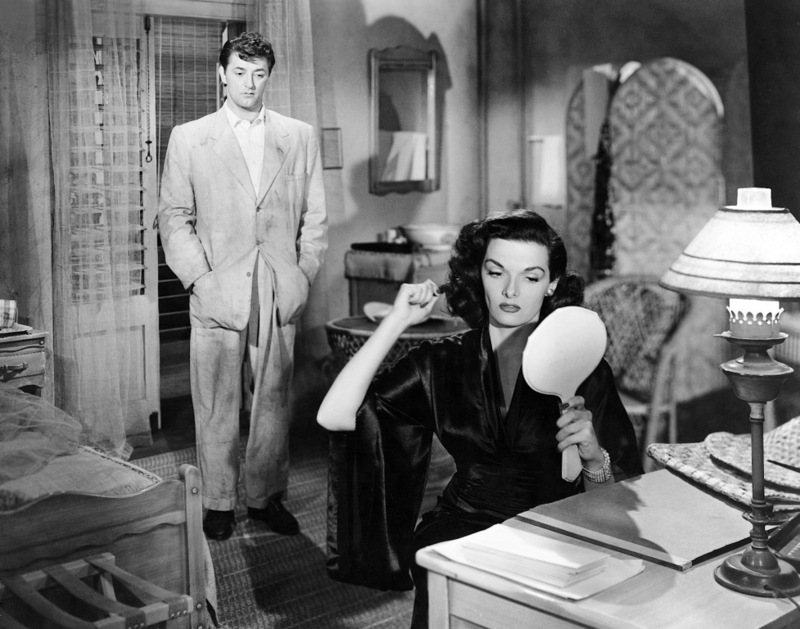 Wild was, apparently, Jane Russell’s personal cinematographer at RKO — Hughes must have assigned him to her. Von Sternberg’s love of shadows and weird camera angles derived from the German Expressionist era, of course, and given what a control freak he was, I have no doubt he directed every shot. I’d love to see something from you about neo-noir!